If you are bored with the old elements in your home then you can redecorate your home to give a new cool look to your place. We may have many aspirations to give a different look to the home. But with inflating prices of everything, we have to limit our aspirations. We can always follow some affordable ways to redecorate our home. Paint the walls- a new coat of paint can completely change the look of your home. Though it is an expensive way to transform the look of your room, but investment in paint lasts for many years. You can borrow shade card from a paint store or take ideas from Internet to choose colors for the walls. Visualize how those colors will look like on the finished walls. Use soothing and light colors as they give a feeling of peace and make the room look bigger. Dark colors make the room depressing and make it look smaller. If you face any difficulty in deciding the colors then, take help of paint store. They take pictures of your home and fill colors on the walls using their software. This will make a clear picture in your mind that helps you in choosing the colors for your home. Pillars, molding or any bulging out area can be painted with a contrasting colors. Flat finish paint is used in ceilings and for walls, you can use paint in semi gloss finish. Curtains- curtains with color combinations can give a vibrant and refreshing look to your place. Curtains come in variety of prints like floral, blocks, printed or some mix and match prints. Block printed curtains are best suited for offices, libraries or study rooms. Floral and printed curtains look good in bedrooms and living rooms. You can use them in combination too. 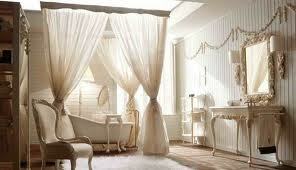 Like net floral curtains can be used in combination with thick printed curtains. Light and soothing colors of curtains create a relaxing environment in our bedrooms. On the contrary, vibrant colors are the best suited for our living rooms where we make happy memories with friends and family. Antique items and paintings- guests visiting your place will not be able to take their eyes off the walls once you hang a beautiful painting or a piece of art on the wall. Besides, you can also keep a beautiful statue in a corner to make the place look wonderful. That doesn’t mean that you have to empty your pockets. You can find such pieces in art galleries on discount. Plants- plants can give a refreshing look to your home. Buy some according to the available space and weather. If your place is small then you can plant some flower bonsais instead of huge plants. You can also keep money plants in the room to create a relaxing environment inside the home. Lighting- your hard work of redecorating the house goes waste if the lighting is dull. Proper lighting in the house reenergizes you. You can also highlight a particular place with lights that makes it look even more wonderful. These tips will transform the look of your house. However, you should take utmost care while selecting the items to decorate the house. Always consider theme and budget before buying items to set the home décor.